rhubarb gone wrong, suddenly goes right! Have you ever had a cooking mistake turn into a new favourite food discovery? Yesterday I wanted to make a rhubarb crumble, so I stewed my rhubarb in a big pot. Unfortunately I added too much water. I normally stew my rhubarb with just a bit of water and minimal sugar. For some reason I added about 3 times as much water as I normally do. I don’t really beat myself up when I do things like this. I thought I would just cook the water off and everything would turn out ok. Not really the best plan. I like my rhubarb to keep its shape as much as possible, so that means cooking it for a short time, not allowing the water to cook off. So, I cooked my rhubarb as I normally do, for just a few minutes and turned the heat off. It was sitting in all that water – not good for my crumble, so I strained the rhubarb and kept the water in my favourite glass mason jar. The water was such a beautiful, rose colour. I returned to making my crumble, placing it in the oven, and washed the dishes to tidy up. I kept looking over at the rhubarb water, which was cool now and thought about what I was going to do with it. I tried a little bit in a glass and wow, was it delicious. Slightly sweet, with a light rhubarb flavour. Delicious! Another by-product of this boo-boo was some mushy rhubarb from the straining process. I had a bit of cinnamon sugar left over from another recipe and I combined this with the mushy rhubarb, thinking that I could cook it down into a syrup because of all the sugar. I emptied the mush and sugar into a medium sized pot and let it cook down into a syrup, reducing it to about a third of it’s original volume. Too hot to taste, I’d have to wait for it to cool. When I did get a chance to taste it, it wasn’t a syrup, but more of a rhubarb jam. Again, another delicious accident. Now I will intentionally cook my rhubarb with too much water so that I can keep the delicious water to use for new flavour discoveries. I can’t wait to have some more food accidents. I just love it when you intend to make something and end up with new tastes and textures. Not all my accidents turn out this well, but it made me think that sometimes we need to look at the positive side of our errors – they may just turn into something great. Do you have any stories of accidents that turned into new favourites? p.s. 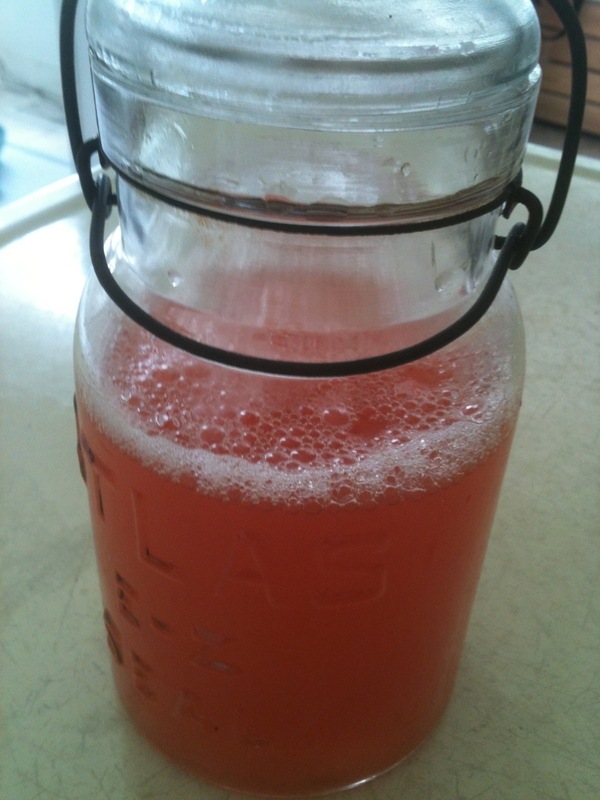 – the rhubarb water is delicious with fresh carrot and ginger juice!